The depths of the ocean were shown on screens at the station, bearing the overlaid text: “Escape the commute and discover the Indian Ocean”. 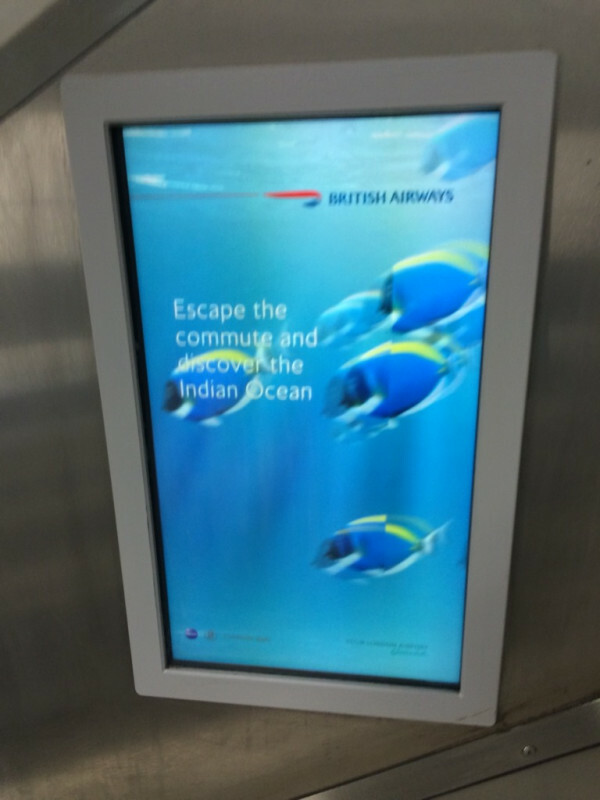 Commuters at Euston Station were surprised to see British Airways adverts encouraging them to fly to the Indian Ocean on the escalators today, days after it emerged the area is where missing Malaysia flight MH370 is likely to have crashed. It is possible the adverts, posted by commuter Alan Milford, pre-date the developments of the tragic situation in Malaysia, but clearly no one thought to pull them. Hopes of finding the wreckage of the plane rose yesterday as satellite pictures emerged showing a possible ‘debris field’ in the southern Indian Ocean. Satellite images showing locations of potential objects related to the search of Malaysia Airlines flight MH370 (Picture: EPA)The images – described by Malaysia’s Transport Minister, Hishammuddin Hussein, as “clearly the most credible lead we have had so far” – show 122 objects scattered over about 400 square kilometres of ocean, ranging from roughly one metre to 23 meters in length. The length of a 777 wing is 27.4 meters. A spokesperson for British Airways commented: “We are very sorry for any offence caused, and the advertising is being withdrawn. Next American Christian Mother Kills Her 4 Yearold Child For Being Gay!